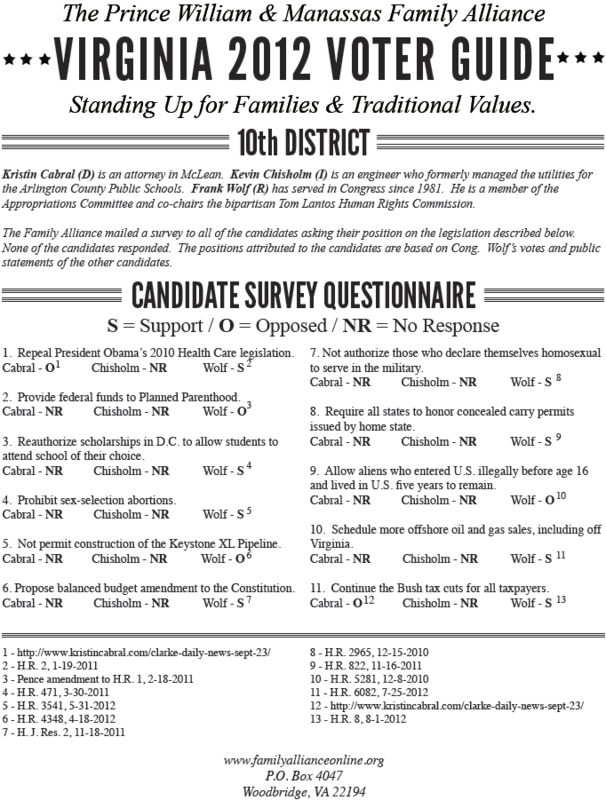 The Prince William-Manassas Family Alliance will distribute the Voter Guide shown below to churches in Prince William County that are in Virginia’s 10th Congressional District. If you are interested in assisting us, please contact us. If you wish to print the guide and show it to your friends, here is the .pdf file. Frank Wolf is the incumbent. For more information check out 2012 GENERAL ELECTION IN PRINCE WILLIAM COUNTY. This entry was posted in Citizen Responsibilities, Voter Guide and tagged Civic Duty, congressional districts, Frank Wolf, government, Kevin Chisholm, Kristin Cabral, manassas, politics, prince william county, Voter Guide. Bookmark the permalink.